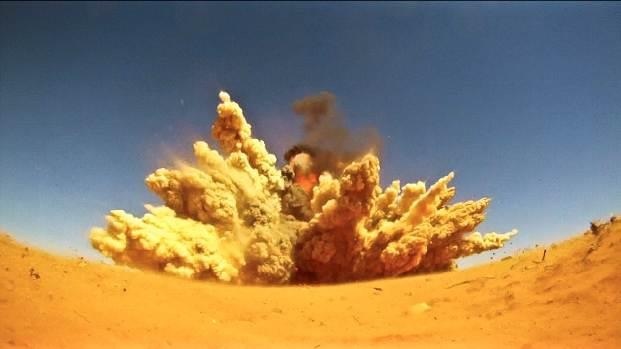 My Day 30 debrief, with some simple statistics about the number of air strikes conducted by NATO in Libya, opened a debate with the readers of this blog and Twitter followers. Someone asked me to compare the Allied Force strike sorties breakdown with the Unified Protector trends, just to have an idea of how the alliance is performing in respect to the previous involvement in Serbia and Kosovo war. The only possible answer is “better not trying to compare” since you’ll get a clear idea of a different strategy and an overall clear vision of the aims of the air campagn and the ways to achieve them. In 78 days of air strikes, NATO flew 38.004 sorties (of 45.935 planned ones….in that area, in that period – March – June, the weather was a factor), 14.112 of them strike sorties. On average 487 sorties were launched each day, 180 being strike sorties, even if during the beginning phases of the war and towards the end, when the air strikes against the Serbian ground forces became more intense, the alliance flew more than 700 sorties every day with roughly one third being bombing missions. Some 20.000 PGMs were used along with some dumb bombs. Regardless the figures (for sure the Serbian military was a dangerous opponent), the operation in former Jugoslavia was focused on a quick achievement of the air superiority and a subsequent instense use of the air power against the ground targets. Hence, comparing the two operations is useless; although, a look at Allied Force shows that, using the required resolve, NATO can be successful even when facing strong “enemies”. 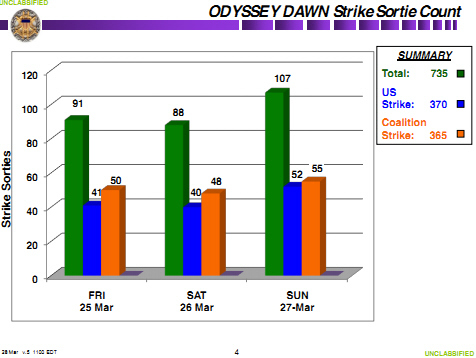 Anyway, the “air strikes debate” urged me to extend the yesterday’s graphs including also the data I could recollect from the first US DoD press briefings on Odyssey Dawn, during which some figures about sorties and air strikes were released by Pentagon. Below, a table with the information released so far (note, not all dates are available). 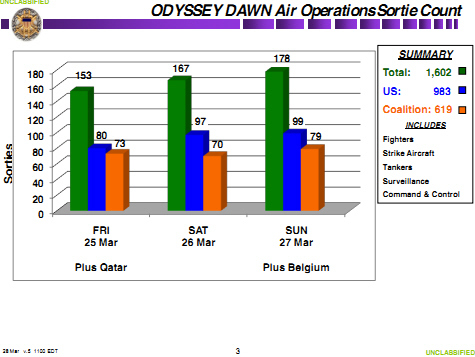 Here are the new graphs (note that NATO sorties are as of Apr. 18 and consider that March sorties are those effectively flown on that date and not those of the previous 24 hrs as NATO’s). After reaching a peak of 107 air strike sorties on Mar. 27, the number of bombing missions dropped. The reason, if you check the figures seems to be that NATO has continued conducting more or less the same number of strike sorties even after US withdrew their bombers. For instance, on Mar. 27, the US flew 52 air strikes and coalition flew 55 air strikes that is around the average count of sorties flown by NATO since US put their bombers on stand-by status. So, a quick examination of this figures show that NATO has not filled the gap whe US withdrew, or at least it hasn’t completely filled it. In the meanwhile, according to NATO, multiple air strikes targeted communications infrastructure and the headquarters of Gaddafi’s 32nd brigade 10 km to the south of Tripoli. “NATO will continue its campaign to degrade the Gaddafi regime forces that are involved in the ongoing attacks on civilians,” the commander of the NATO operation, Lieutenant-General Charles Bouchard, said. The question is: how long will it take considering the current sortie ratio? 1) Italian Minister of Defense La Russa explained to Sec Def. Robert Gates that Italy will not change its mission and will not supply more planes to Unified Protector. 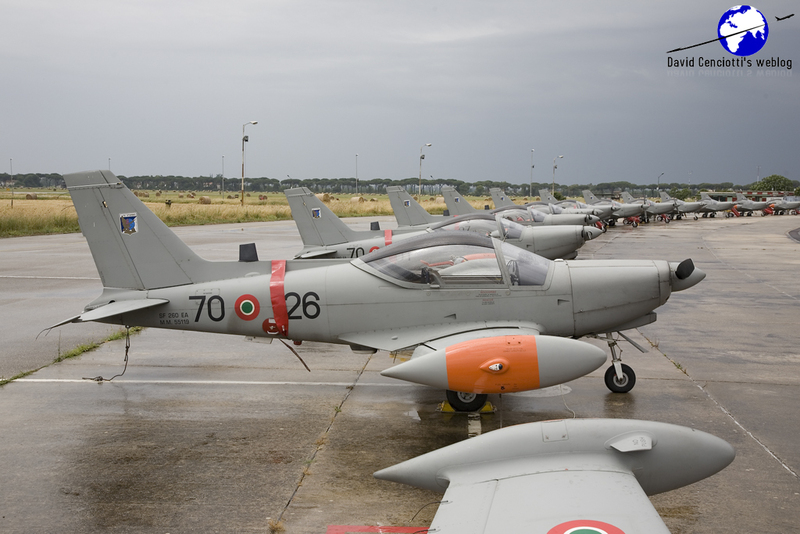 Hence, the Italian pilots will continue flying “airshow” sorties and there will be no Tornado IDS dropping PGMs in Libya. 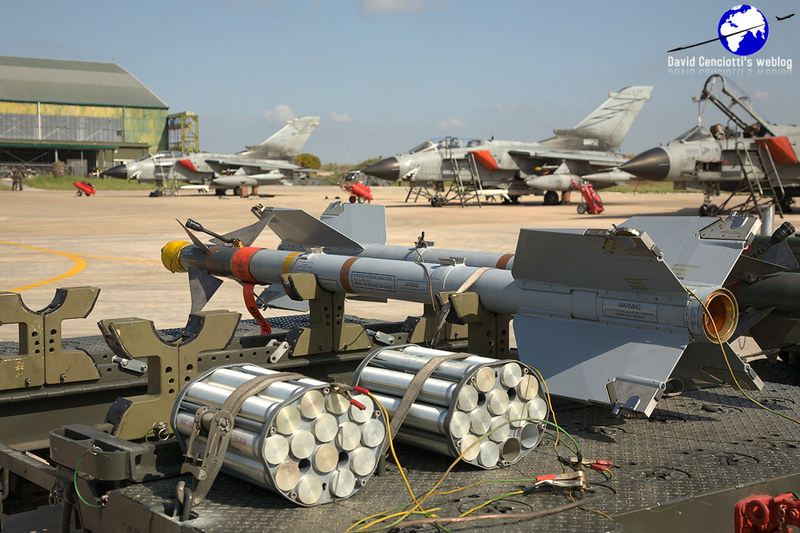 I still can’t understand what will happen if/when a Tornado ECR will detect an active SAM radar site and will be asked to hit it with an AGM-88 HARM missile…..
Do you think it’s not going to happen because there are no more active radar sites in Libya? Yesterday, an US F-16CJ hit and destroyed 2 SAM sites near Tripoli in a SEAD mission bringing to 8 the total SEAD strikes since Apr. 1. In the meanwhile, in the previous 24 hrs, the Italian contingent flew 5 missions (2 sorties each): 1x Tornado, 3x Typhoon, 1x AV-8B Harrier from Cavour aircraft carrier. 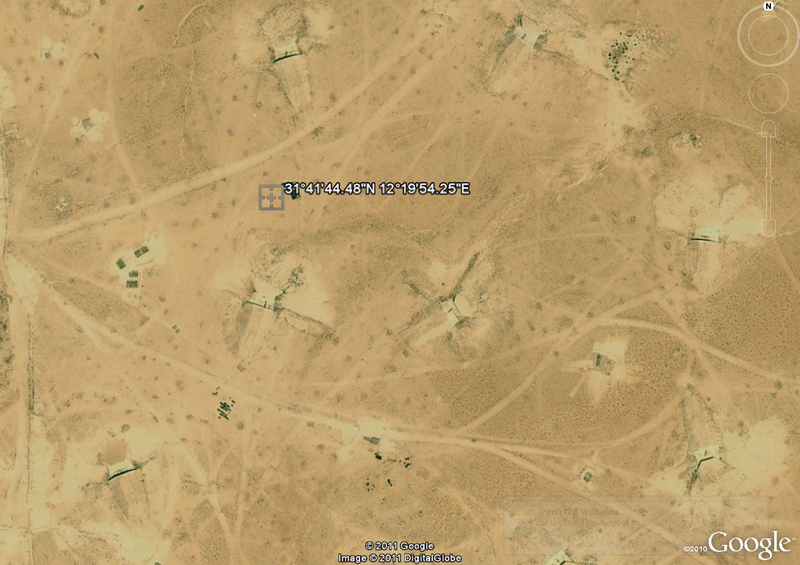 2) Giuliano Ranieri, after checking on Google Earth the location of a NATO air strike asked me what are the shelters almost hidden in the desert around coordinates 31°41’44.48″N 12°19’54.25″E. 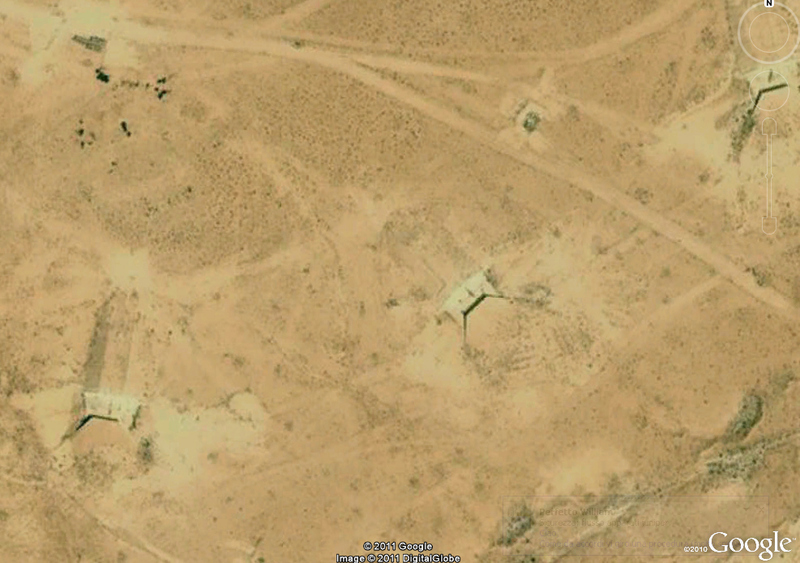 I wonder if they could be related to the underground storage facilities I wrote about yesterday and, while I hope that some of those OSINT experts reading this blog will be able to explain me what’s stored inside those shelters, I suggest you reading another old article that Richard Clements found and brought once again to my attention: Libya’s “Secret tunnels of death”.